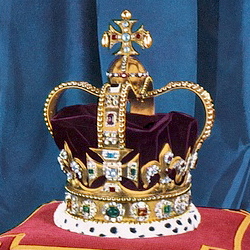 Originally set with hired diamonds, the crown is set with crystals for display in the Jewel House at the Tower of London. Mary also had a diadem, also in the Jewel House, and a coronation crown, now owned by the Museum of London. 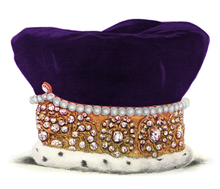 The gold crown originally had 523 small diamonds, 38 large diamonds, and 129 large pearls. These have been replaced with quartz crystals. It is 19 centimetres (7.5 in) tall and weighs 700 grams (1.5 lb). The crown is decorated with crosses pattée and fleurs-de-lis and has four half-arches, surmounted with a monde and cross pattée. Traditionally, when a king is married, his wife is crowned as queen consort at their coronation ceremony. In 1649, the monarchy was abolished after a long civil war between Charles I and his Parliament, and the Crown Jewels were either sold or turned into coins by the Mint. In 1685, Mary of Modena, wife of James II and VII, was the first queen consort to be crowned after the restoration of the monarchy, Charles II having been unmarried when he took the throne in 1660. Three pieces of headgear were made for the queen: a diadem to wear in procession to Westminster Abbey, a coronation crown for the crowning, and this state crown to wear upon leaving the Abbey. 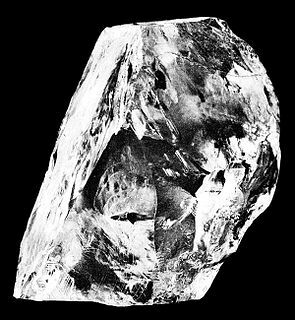 Made by Richard de Beauvoir, it was covered in diamonds valued at £35,000, and the bill for hiring them was £1,000. She paid for the crowns out of her own pocket and also commissioned two new sceptres and a coronation ring for the ceremony. Mary's diadem was set with 177 diamonds, 78 pearls, 1 sapphire, 1 emerald, and 1 ruby; it now contains artificial gemstones and cultured pearls, and is also on display at the Tower of London. It is 8 centimetres (3.1 in) tall and weighs 300 grams (0.66 lb). Her empty coronation crown was acquired from a private dealer by the Museum of London in 1956. It had been sent to the Crown Jewellers, Rundell & Bridge, for maintenance work in the 19th century, but was never returned to the Royal family. Originally, the crown weighed 600 grams (1.3 lb) and was set with 419 diamonds, 46 large pearls, 7 rubies, 7 sapphires, and 2 emeralds. It was subsequently used by Mary of Modena's stepdaughters Mary II and Queen Anne, and also by George I; Queen Caroline, wife of George II; and Queen Charlotte, wife of George III. 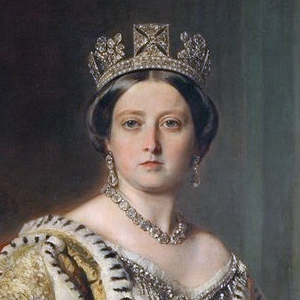 In 1831, the crown was judged to be too theatrical and in a poor state of repair, and it was replaced with the Crown of Queen Adelaide for her coronation alongside her husband, William IV. However, it is possible that Adelaide was crowned using one of Mary of Modena's crowns. ^ a b c d e f Rose, pp. 36–37. ^ a b Mears, et al., p. 25. ^ Olivia Fryman in Bird and Clayton, "Ceremony and Coronation", p. 100. ^ Olivia Fryman in Bird and Clayton, "Ceremony and Coronation", p. 63. "Mary of Modena's Crown of State". Royal Collection Trust. Inventory no. 31707. "Mary of Modena's Diadem". Royal Collection Trust. Inventory no. 31708.